Note: Get the full lineup of FCBD Mini-Con 2015 guests here. Free Comic Book Day Mini-Con is TODAY, Saturday, May 2, 2015. Doors open at 9 a.m.
Chris Wisnia has been creating, writing, drawing and publishing comic books for ten years. His works include, "Doris Danger Giant Monster Adventures" and "Monstrosis" (SLG Publishing), Sam Keith's "Ojo" (Oni Press), Tabloia Weekly Magazine (Salt Peter Press), "The Lump," and the online masked vigilante encyclopedia, "The Spider Twins Companion." 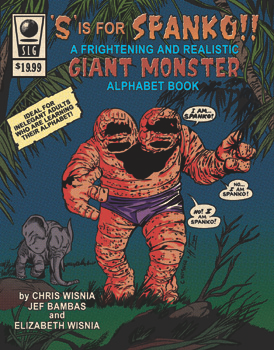 Chris recently collaborated with his wife, author Elizabeth Wisnia, and fellow illustrator Jeff Bambas, on "S is for Spanko: A Frightening and Realistic Giant Monster Alphabet Book." We couldn't be happier than to have this multi-faceted talent with us. Come on down, meet Chris and check out his monster creativity on May 2.